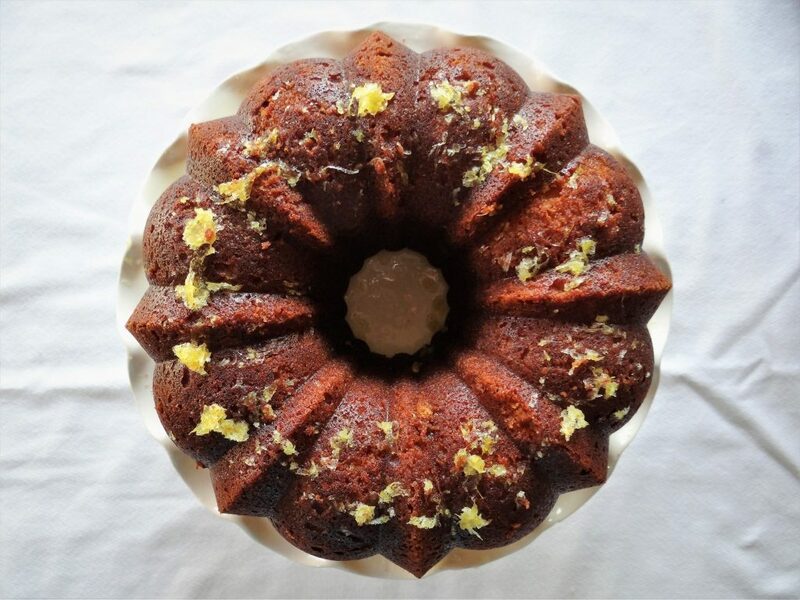 There is a wonderful story that goes along with this recipe for Moist Lemon Pound Cake. It involves a very sweet lady that I had the opportunity to work with many years ago. Her name was Wilma. She was bright, hard working and everything you could imagine when you think of a kind-hearted Southern woman. I got to know Wilma at my first assignment in the Air Force at Reese Air Force Base in Lubbock, Texas. I was just 23 years young. A 2nd lieutenant in the Air Force walking into a huge aircraft maintenance organization. To say I had a “deer in the headlights look” when I walked in that first day would be an understatement. But, I learned quickly to rely on the wise, experienced men and women who had been doing their jobs in maintenance probably longer than I had been alive. Everyone was so genuine and offered to teach me everything I needed to know. I think what also made this assignment so wonderful was the good ol’ Texas town of Lubbock. Everyone was so warm and so Texan! I always considered Lubbock a “big-little” town tucked up in the panhandle of Texas. It was a big town in the sense that it had the Air Force base, and of course Texas Tech University. However, what made it little was the small town personality of the people who lived there and called it home. While I was stationed there, I worked with some of the greatest, down home individuals you could ever meet. One thing I learned very quickly in most military organizations is that the people were not only hard workers, but they also loved to have fun. Almost every Friday we would have some sort of potluck, cook off or barbecue. It really helped us all wind down the week and get to know each other a little more on a personal level. Somehow as we all enjoyed and shared each other’s favorite recipes, I learned so much more about the incredible people I was working with. Well, this is where Wilma’s Moist Lemon Pound Cake was introduced. After I tried it for the first time, I realized I had never tasted a cake so moist and full of lemon flavor. Then when she shared the recipe with me, I discovered what made the flavors of this cake so magical. The recipe starts out like most pound cakes, with lots of butter, sugar, eggs and flour. But then, what makes it super moist and lemony is the addition of peach nectar and lemon jello. Yes, I said lemon jello. Do they even make that any more? Yes they do! And I am so glad because this recipe would not be the same. What is so awesome about the jello is it takes the place of some of the sugar and really gives an extra pop of lemon flavor to the cake. Now I am sure you are wondering where in the world one can find peach nectar. You can either find it in the juice aisle at the grocery store or the International Food section with the Goya brand Hispanic foods. It comes in small cans so you can use what you need for the pound cake and then make yourself a flavorful smoothie or drink with the rest. The nectars come in other flavors like pineapple, pear and mango so you can experiment with this recipe and change the flavor profile very easily. You have a choice of making this recipe in two loaf pans or a bundt pan. 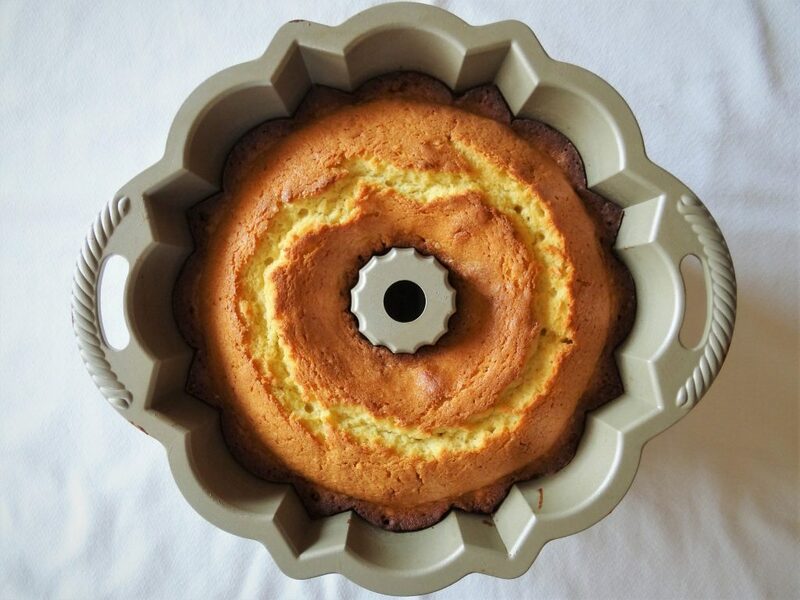 I don’t know about you but I love how pretty a pound cake looks in a bundt or other shaped pan. In addition, when I use a flour based cooking spray with this pan, the cake slips right out! Then, the icing on the cake, literally, is a simple glaze of lemony, sugary goodness. You pour it over the cake while it is still warm, so it seeps down to make the cake even more moist! The glaze also adds that final kiss of lemon flavor! 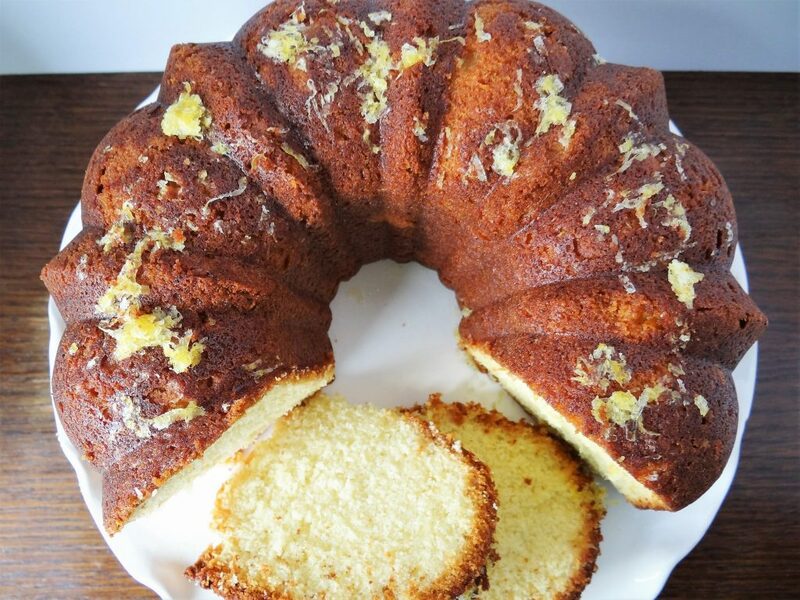 So, just in case you were wondering, you do not have to be Southern or even a Texan to make and enjoy this wonderful recipe for Moist Lemon Pound Cake. But, do remember it came from the kitchen of a sweet woman named Wilma, who was not only a great cook, but also had a warm, gentle soul. Food and friends make so many memories. What could be better than that? So enjoy and Happy Southern Baking from the Memorable Kitchen! Preheat the oven to 350 degrees. Prepare a 10 cup bundt pan or 2 one pound loaf pans with flour based cooking spray. In a large mixing bowl, place butter, 1½ cups sugar and lemon jello. Beat on medium speed for 5 minutes or until light and fluffy. Add in eggs, one at a time, beating each about 1 minute. Scrape the sides of the bowl. Add in ½ of lemon zest and extracts. Beat for one additional minute. Blend together flour, baking soda, baking powder and salt in a small bowl. Mix together ¼ cup lemon juice, peach nectar and buttermilk in a separate bowl. Blend ½ of the flour mixture into the butter/sugar/egg mixture. Mix just until flour in incorporated. Add in half of the liquid mixture. Blend together. Add in the remainder of the flour and liquid mixtures and blend in with each addition. Pour into a prepared pans. Bake for 50-60 minutes. Let cool for 30 minutes. Turn out onto a serving plate. In a small sauce pan, place ½ cup sugar and ½ cup lemon juice. Cook on medium heat for 3-5 minutes until sugar is dissolved. Stir in remaining lemon zest. Pour over warm cake. Serve with fresh berries and whipped cream, if desired.